This is a single piece bat that upgrades the 2018 Beast X Speed/Loaded in noticeable ways. The barrel construction is longer, the handle is reinforced with a stiffer feel and they’ve added a custom Lizard Skin to the bat. They’ve also kept hold of the short 29-inch as well as sizes up… Jump to the full review. We aren’t the only ones to have information about the Alpha. Other places, in particular those who sell bats, usually have a boiler plate write up on the specs of a bat. Many of those we reference to make sure we are seeing what we should be. Here are some more references for the 2019 Easton Alpha review. This is a single piece bat that upgrades the 2018 Beast X Speed/Loaded in noticeable ways. The barrel construction is longer, the handle is reinforced with a stiffer feel and they’ve added a custom Lizard Skin to the bat. They’ve also kept hold of the short 29-inch as well as sizes up through the 34-inch. 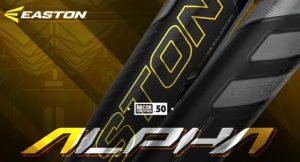 Those in the market for a stiff feel on a reasonably priced performance BBCOR bat will like the 2019 Easton Alpha. As the bat is in pre-sale, we don’t have a ton of data to base recommendations and expectations. We will hold judgement until we capture more information. But, in terms of what the 2019 Alpha is all about, we write that in this review. The major difference, functionally, between the Beast X Speed and Easton Alpha is the stiffness in the handle. The project 3 team for Easton added some components underneath the hood of the single piece handle to make it more stiff. This is an improvement. (The do reinforce the aluminum with some composite pieces. This is much different than the Beast X which was a true aluminum bat. As well, you might notice, Easton is using Lizard Skin Grips. Previously, this honor was bestowed upon new Louisville Slugger grips. But, for 2019, Easton secured that exclusive contract. We have yet to have enough access to the bats to determine the swing weight or exit speed of the Alpha in relation to the Beast X Speed. Our expectation is the bats swings like the 2018 Speed. If you want a heavier swinging bat then look for the Alpha Lock & Load. The single piece aluminum is replete with options. Bats like the Velo, 519 Omaha and DeMarini Voodoo One are prime examples. But, even Easton has a few other performance options like the Fuze. Easton has pushed the idea of a unique lab whose entire focus is to drive innovation in bats. We bet this is not different then the lab they have always used. But, the idea that Easton has put in thousands of hours and millions of swings is worth noting. There is simply no way small time companies have the resources and experience to drive this type of insight on bats. DeMarini has recently done a similar thing in their “D-Lab”. We also note, bat innovation is something engineers spend years on. Many innovations you see in bats today, like extended composite end caps or carbon reinforcement inside of aluminum barrels, have sat on the work desks of bat engineers for years. Easton, an obvious leader in the space, continues to do this under the Project 3 Lab. We kept track of Easton’s 2019 bat performance in the 2018 College World Series. Many players ended up using the Alpha (as they had access before everyone else). Those who used the Alpha X (in 23 plate appearances) didn’t have the best of tournaments. Only 4 hits, 1 for extra bases. But, the fact more than a few elite college baseball players chose to use the Alpha is saying something. These players have access to a number of bats, including older Easton models. Yet, they chose the Alpha. The 2019 Easton Alpha is a single piece bat that uses a combination of aluminum and composite in the barrel. This design lends to a longer barrel. It is not a true hybrid design—as that term is reserved for those with an aluminum barrel and composite handle. But, the bat does swing light and has a long barrel. Compared to the Z-Core or Beast X from last you can expect a different sound and swing weight. This is a BBCOR only bat in lengths from 29 to 34-inch.